Stephanie Eltz is a Trauma & Orthopaedic registrar training in London. She is also the founder of Doctify. 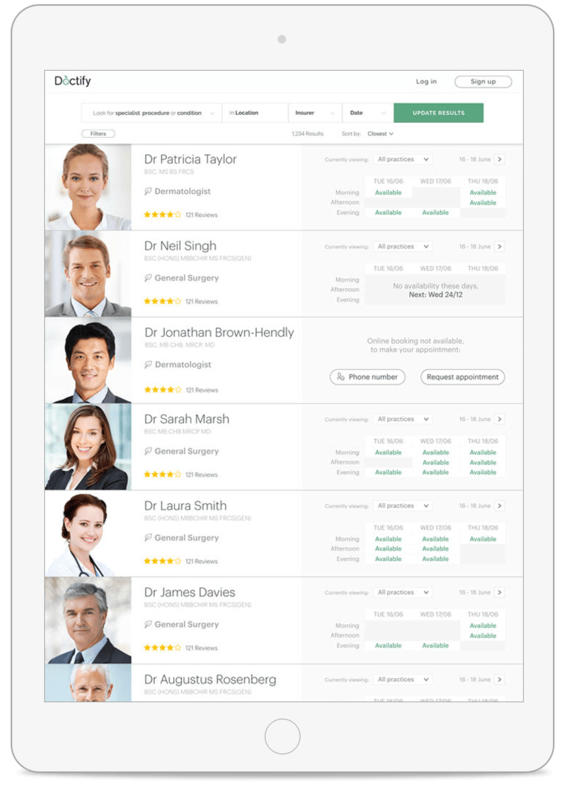 Doctify is an online platform allowing patients to book appointments with specialist doctors from any device, 24-hours a day. You can also read reviews left by other patients and if you are after an urgent appointment, the online tools allow you to quickly see the next available doctor. The online marketplace is beneficial to both the patients and the doctors who can now easily increase their online reach through this transparent and trusted site. Thanks very much for spending some time with us today. How was it that you first became interested in this area, and what was it specifically that drove you to found Doctify? I had a personal experience where I needed to find a doctor near me who was available on my day off. I was too anxious to wait for my NHS appointment. I was willing to spend money for the right doctor but was unable to find someone suitable. I have also always had an entrepreneurial drive that I channeled into numerous NHS audit projects. After my 10th audit, I was looking for a bigger challenge in a world where I could achieve something by rolling up my sleeves and where I could be creative. How did you start to assemble a suitable team, and do you have any advice for others looking to do this? 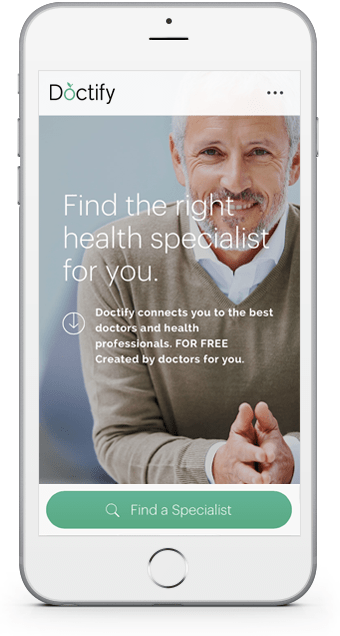 The Doctify app on iPad and iPhone allows you to select from a wide range of doctors and use filters such as speciality, location and average rating. When I was contemplating the idea behind Doctify, I turned to my best friend Suman, who is also an Orthopaedic surgeon. I can only recommend working with a friend. It’s been the best decision I made. Suman and I knew that we needed to work with someone with a business background to help us implement our idea. I looked through my network and managed to convince Daniel to join us. He had just left a successful banking and consulting career. Business people dream of wearing a hoodie and being their own boss (who doesn’t?). Finding a CTO was challenging. It’s also wise to let other computer engineers interview the candidates for you for technical competence. I certainly didn’t feel experienced enough to understand who the best candidate would be. When you have someone in mind, you then have to convince them to work with you. Tech engineers are high in demand and companies such as Facebook pay unbelievably high salaries. The most important thing to do is to make sure that you don’t choose people based on their CV but based on their personality. People working in a startup need to be able to put on a suit and convince investors to invest. But most importantly, they need to be happy to roll up their sleeves and sweep the floor in your company. You have to find people who are flexible, dynamic and hard working. I can only recommend working with a friend. It’s been the best decision I made. Do you have any advice for people interested in becoming entrepreneurs, but unsure of how to find a suitable area/ focus? Getting to the stage where you have a fully functioning company takes a lot of effort. You will have sleepless nights, lose hair, never see the gym and forget your own birthday. I think you have to be obsessed with solving a problem rather than wanting to become an entrepreneur. If you solve the problem, you’ll have created real value. Talk to many people to test your idea but don’t be too put off by initial doubters. As a doctor, you have a duty towards your patients and your clinical work has to be prioritized above everything else. I would never compromise on that. I am 150% focused at the hospital. You have to be very organized and compromise on your life outside of work. Say goodbye to your friends and the pub. Some of my colleagues manage to work and raise children – balancing that must be so much more challenging! The good news is that working on your own idea or company is like building your house. It’s creative and enjoyable and fills you with passion and true happiness. Do you have any advice for doing so? Investors will be concerned when you talk about balancing a clinical career and driving your business. It’s not unusual for med tech companies at all but you have to make sure your absence is covered and that you add as much value as your full-time startup colleagues. What have been the main challenges that you have come up against in Doctify so far? Working together on a startup can be very emotional. Everyone risks so much and anxieties can bring out difficult personality traits in humans. Managing that and making sure that your startup has the right culture is a big challenge. When you get it right then everyone feels like they are part of a family. Investors will be concerned when you talk about balancing a clinical career and driving your business. What did you do to overcome these? It’s like a relationship. You have to talk and talk and take yourself back and compromise. You are only strong together. How did you secure your initial funding? Do you have any advice for other start-ups looking for funds? Second, you have to have a good idea that you can monetize. Lastly, you need to have a good presentation (deck) with future projections for your company. Don’t give up if people tell you that you are crazy. It’s normal and can also sometimes be a tactic used by investors looking to lower your valuation. Be persistent and keep putting yourself in the right place at the right time. A bit of luck is helpful too! Don’t worry about people telling you it’s not going to work. It all depends on you. With the power of hindsight and experience, is there anything that you would have done differently? This might sound very cheesy but no. We learned from the mistakes we made. However, I do sometimes think that I should have listened to my heart more often. What would be your top 3 tips or the best advice you’ve been given, for someone starting out? Enjoy working on your idea, enjoy the ups and downs. Don’t forget to celebrate the good moments! Watch dragon’s den, be inspired and get a hoodie. Live your dream. Don’t give up if people tell you that you are crazy. It’s normal and can also sometimes be a tactic used by investors looking to lower your valuation. Thanks very much for your time and advice Stephanie. We really appreciate you taking the time to share it with our Doctorpreneur community.